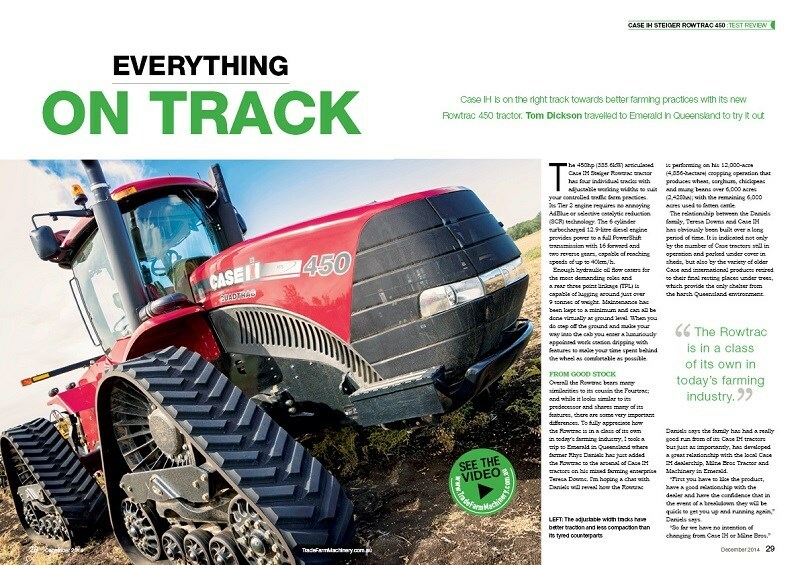 The Case IH Steiger Rowtrac 450 has gained quite a lot of traction (pun intended) since its arrival in Australia about a year ago. Now we got our hands on a model for a test drive. Berrima Engineering has bagged multiple awards over the years for its range of hay rakes, but the company claims its latest model, the BR1000C, developed especially for contractors, is its best one yet. We take a closer look. The ability to seed accurately and be folded into a comfortable width of 3m for transportation has scored Duncan Ag's Renovator AS5000 airseeder the title of "Best Imported Machine of the Year" at the recent 2014 Elmore field days. NFM takes it for a spin. West Gippsland farmer Niels Olsen has combined his farming knowledge with his passion for soil chemistry to come up with an innovative machine that aerates and mulches the soil while it seeds. So far, results have been outstanding. NFM managing editor Anna Game-Lopata finds out more. 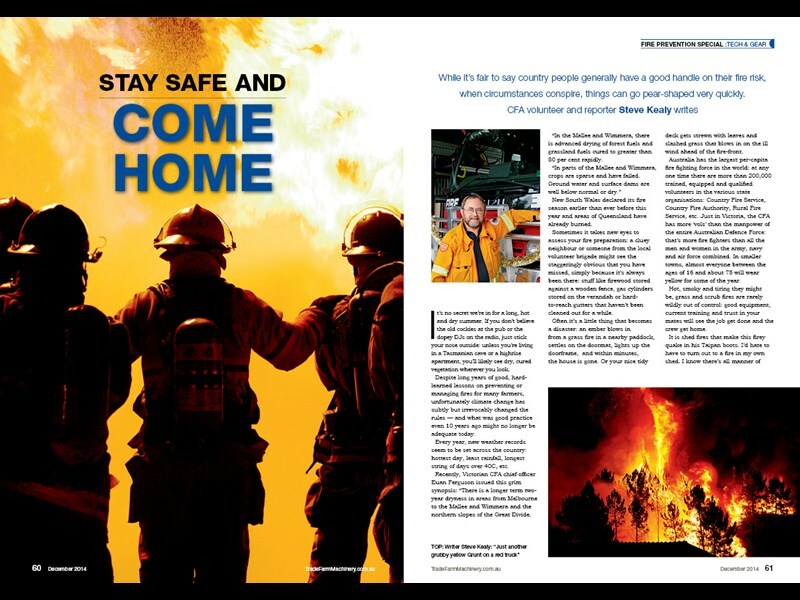 Fire season is upon us, so this month NFM featured a fire prevention special to prep you for the heat. What to look for when buying a cultivator? 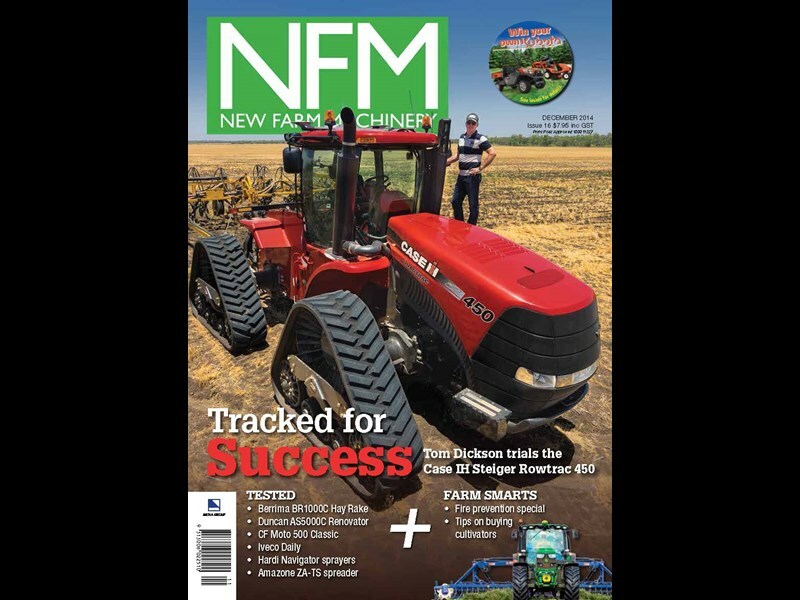 NFM machinery gurus Dr Graeme Quick and Tom Dickson offer some words of wisdom. 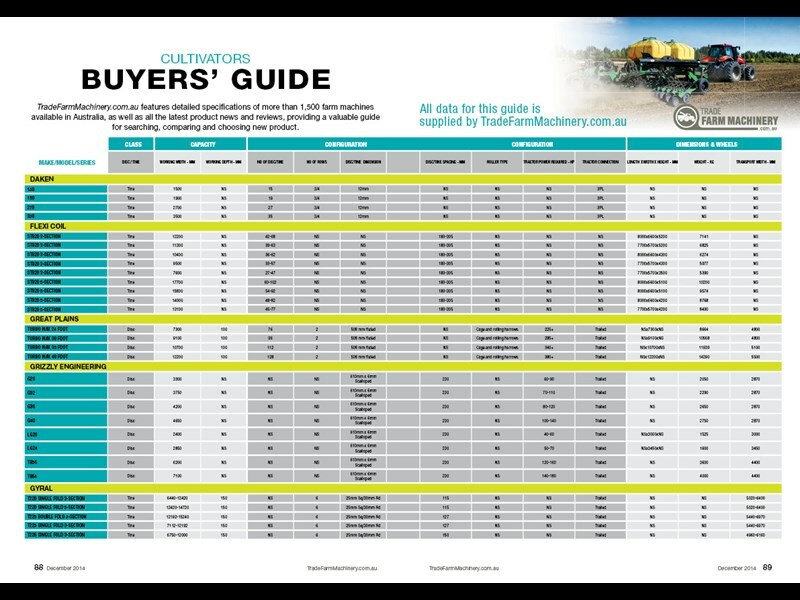 Look up cultivator specifications of all different makes and models in our 18 page Cultivators buyers guide. 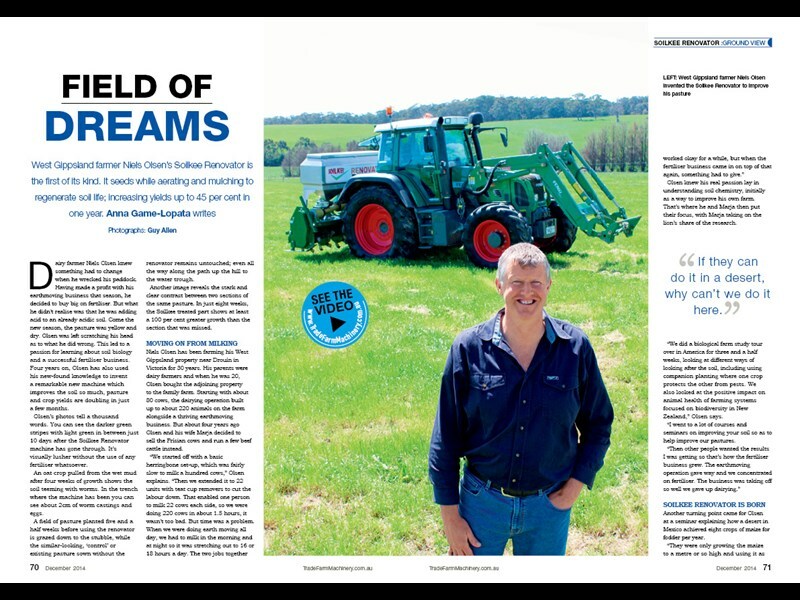 The December issue, out December 1 features in-depth looks at award-winning machines closer to home, namely a Berrima Engineering hay rake and Duncan Ag’s Renovator AS5000 seed drill. 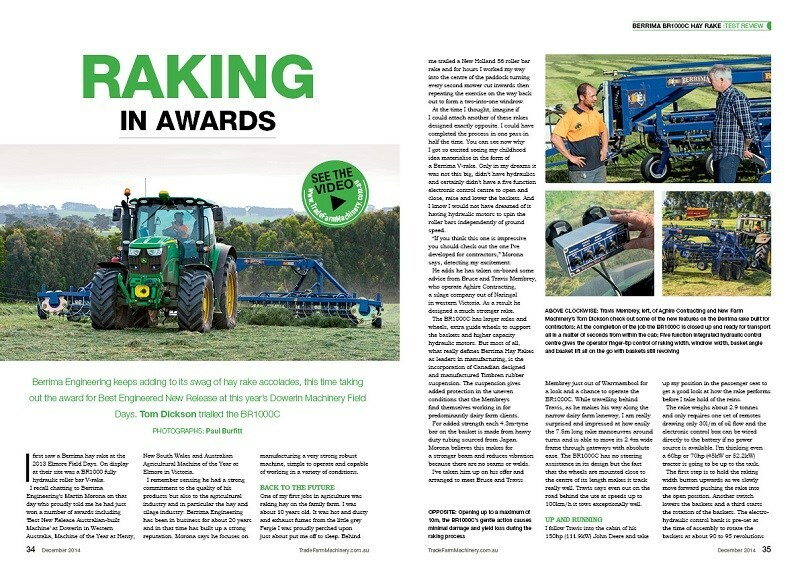 No stranger to awards, Berrima Engineering took out a Best Engineered New Release accolade at this year’s Dowerin Machinery Field Days for its BR1200 roller bar hay rake, on top of countless awards bagged over the years at Australia's leading field days including the Henty and Elmore field days. NZ-based Duncan Ag, on the other hand, won the coveted Best Imported Machine of the Year at the 2014 Elmore field days for its Renovator AS5000C custom drill. NFM wasted no time in organising a test review to see what exactly separates the machine from others on the market. Suffice to say we can see exactly why the panel of judges were so impressed with this machine. (Watch the Duncan Ag Renovator AS5000C airseeder review video) Don’t miss the full test report in this issue. Dairy farmer Niels Olsen had a thriving earth moving business and 220 cows on his west Gippsland property near Drouin in Victoria when he wrecked his paddock by adding fertiliser to his already acidic soil. Olsen decided to get to the bottom of soil chemistry for good. He used his newly found expertise to build a thriving fertiliser business and invent a machine that had the pasture yields of sceptical customers doubling in just a few months. Just in time for Christmas, Col Jackson takes a look at the growing sandalwood industry, which provides the essential ingredient for many of the expensive perfumes that could be under the tree this year. The minimum price for sandalwood oil has been US$2,500 per kilogram (A$2,891/kg), but Tropical Forestry Services (TFS) Corporation, the world’s largest vertically integrated grower, processor and distiller of Indian Sandalwood is currently selling it for US$4,500/kg (A$5,204/kg). Read what makes sandalwood so lucrative. 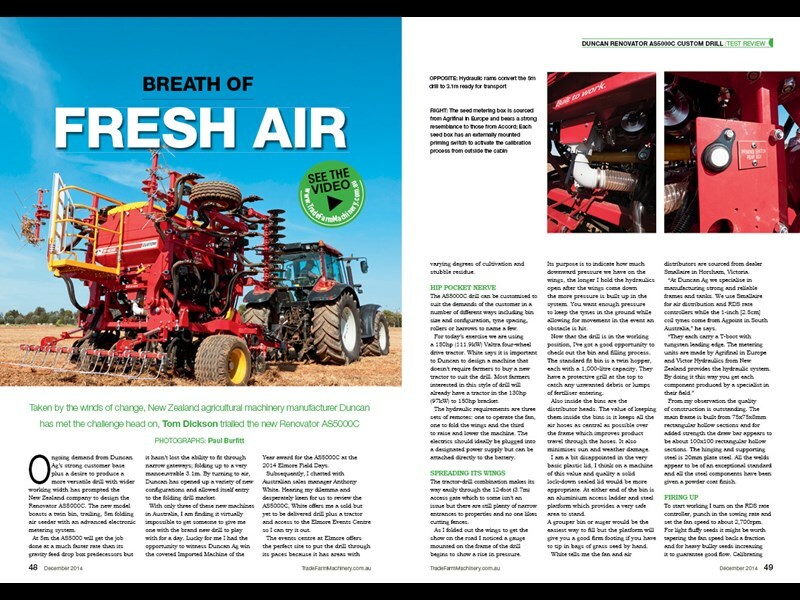 With fire season well and truly upon us, New Farm Machinery offers a fire prevention special with contributions from reporters Matt Wood, Barry Ashenhurst and Steve Kealy; the latter two also being CFA volunteers. Farm machinery guru Dr Graeme Quick reveals the answer to a question we’ve all been asking — can an eight horse team out pull an 8hp tractor? 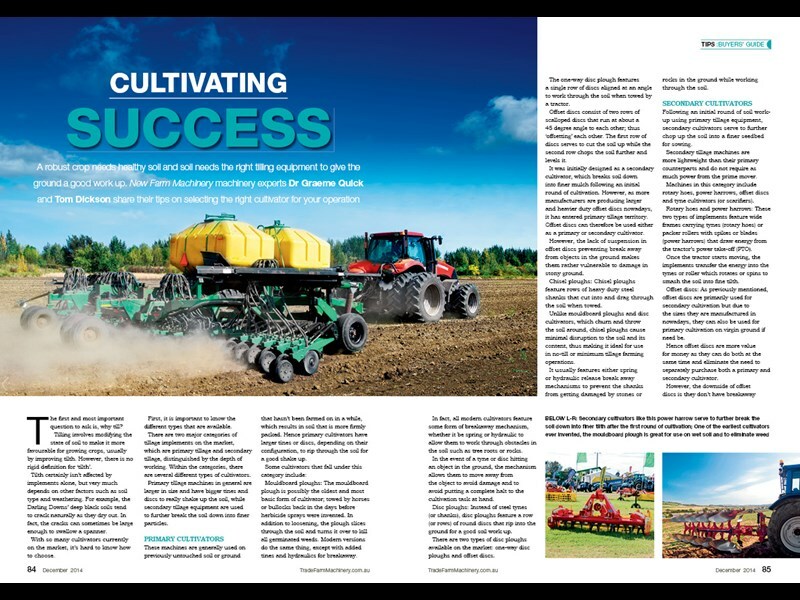 Finally, NFM’s buyers guide this month covers all things cultivators; with a comprehensive piece by machinery gurus Dr Graeme Quick and Tom Dickson on what to look for when buying a cultivator, as well as a hearty 18 pages of cultivator specifications. Make someone’s Christmas by getting them a 12 month subscription of New Farm Machinery magazine.